"Will I ever be done, transformed in the past tense, or will I always be transforming, better and better until I die?" 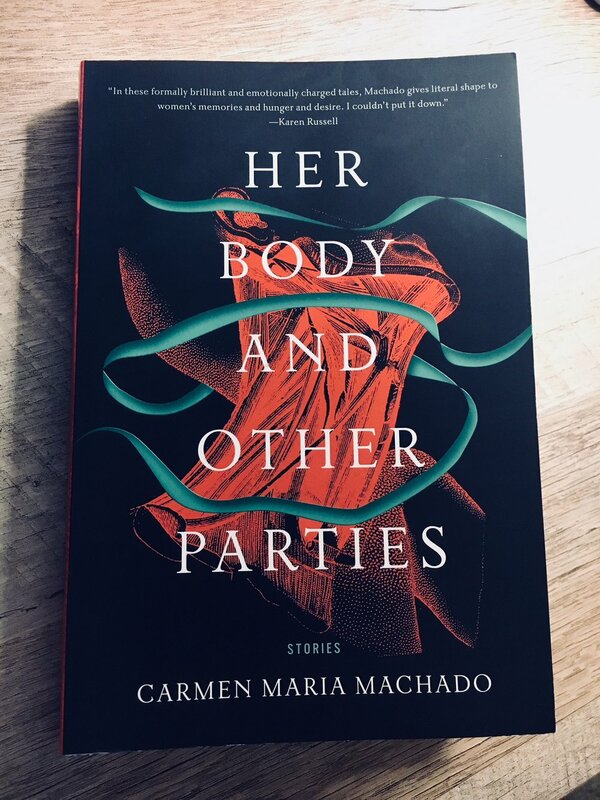 That weird liminal space between Christmas and New Year's I was completely entangled in Carmen Maria Machado's Her Body and Other Parties. When I think back on this collection I keep coming back to the phrase "sloughing off," one Machado uses many times in different stories. Slough: a swamp. Slough: a situation characterized by lack of progress or activity. Slough off: to cast off (as the skin of a snake). Maybe that's something of an apt metaphor for the women in this collection. Powerful, coiling, venomous, sexual. Shedding some old self, and finding a new self underneath that is somehow more raw and taking up space. In the story "Eight Bites," this sloughed off self is especially present. It's winter and a woman in a Cape Code decides to undergo gastric bypass surgery. Only after the surgery is over and she's her newer, smaller (happier?) self - the rest of her body comes back to haunt the house. I can't not think of Roxane Gay's Hunger when I read this piece. In her memoirs, Gay writes "we continued to delude ourselves that our bodies were our biggest problem." Because the body is an easy target when the real hurt is harder (or more painful) to disseminate. And the hurt for Machado's protagonist is three-pronged. In part because of a pregnancy that "wrecked me, like [the child] was a heavy-metal rocker trashing a hotel room before departing," and in part because of shame, "looking into the mirror and grabbing the things that I hated and lifting them, clawing deep, and then letting them drop." These two are connected - this body hate that comes from motherhood and, also, just having a body. But it's deepened and worsened somehow because of this triage of now-thin sisters (and memory of an iron-willed mother) who had somehow mastered the art of restraint. "Eight bites" is a TERRIFYING prescription. How impossible! How far behind the protagonist feels. She chides herself for having no self-control and so decides to relinquish it - but how can you relinquish what you never had? This story is confronting the mangled idea of 'self control,' which is usually coded self hate. This feeling that to meet certain criteria (to be 'in control') is to earn love and a happy place in this world - that to take up less space is to somehow merit more love. I love that the protagonist's daughter is fighting so hard for her mother to confront NOT the body but the REAL THING underneath. She calls and says, "You think you're going to be happy but this is not going to be happy," and "Mom, I just don't understand why you can't be happy with yourself. You've never been--"
Ah, but the best part is when her body comes back. We get a little premonition of this during the protagonist's last meal, as she's devouring oysters and one fought back, "anchored to its shell, a stubborn hinge of flesh." Later she calls it "mindless protein." That's pretty much what comes back to haunt her: a person-shaped outline, a presence. A boneless lump she confronts in the basement. There's something tentative about this meeting - the protagonist is curious, gentle, touches its shoulder, feels it eyelessly look at her. Then she says, "You are unwanted." Then she begins to destroy her. Everything in this story feels mirrored and opposing: "all of [the people] were alone, even when they were with each other," "sometimes [you could hear] a muffled animal encounter in an alley: pleasure or fear, it was all the same noise," "I could not make eight bites work for my body and so I would make my body work for eight bites." Mirrors are deeply weird that way: the self you see is not the self everyone else sees. You are optically inverted. You don't see yourself correctly. This is why in photographs we are sometimes surprised by who we see. This is why it is painful for people who love us to hear us say we hate ourselves. This story is devastating because of that palpable self-hate. Because of (what feels like) the victory of and inheritance of self-hate. It was never the body's fault. It was maybe never anybody's. In this story Machado writes, "A new woman does not just slough off her old self; she tosses it aside with force." These sentences sear into me - camouflaged as powerful, assertive. But a snake sheds its skin because it is growing, not shrinking. There is no violence in it. No malevolence. Carmen Maria Machado has her protagonist confront her truest, softest, warmest self, and shows the tragedy of that wreckage. How mistaken we are to see our bodies as something conquerable, something separate. How devastating to objectify and reconstruct oneself. How difficult and wrenching it is to self-love.